The plan says: You might prefer its picturesque beauty to the common shed type of tool houses. It is sized 8ft x 8ft x 8ft in height to provide maximum storage space, since the plywood construction eliminates the usual frame type of construction. The only frame members are the nailing strips for the plywood joints. Its structure is amazingly strong, and efficient use of the full sheets and cuts of plywood. By building its broad roof, you will have low maintenance with small wall areas to be kept painted. This is a vintage plan. We classify a plan as vintage based on two primary conditions; 1. its at least 20 years old and/or 2. the company that produced the plan is no longer in existence. Vintage plans were typically printed many years ago, thus, they may not contain the same amount of detail as found in plans produced today and they may refer to hardware and terminology not currently in use today. The copy you see here is one that we acquired through the purchase of wholesale lots of woodworking plans from individuals, estate sales or inventory buy outs of companies no longer in business. We have inspected the plan to make sure its condition is suitable for sale. The price reflects its condition. Pictures we use are either ones directly from the plan, or from images we found online. Please see the larger image slideshow to see pictures (if available) of the item you will receive. This plan may reference hardware parts that are no longer available so please be flexible in your building process. We do not have sources for out-of-date parts unless otherwise stated in the description above. Condition of this recycled plan: Good (priced as marked). Plan is printed on two sheets of 17 x 22 inch paper. Any reference made to sources for specific hardware may no longer be available as the business mentioned is no longer is business. Speak with your local hardware store clerk or search online once you receive the plan. If we find suitable sources, they would be listed here. Our stable provides a two dimensional shelter to accompany the scene of the Nativity. 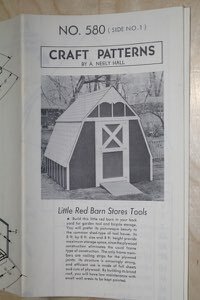 The plan says: Build this little red barn in your back yard for garden tool and bicycle storage.